The format of the address is the following: an SPO prefix, followed by an underscore and a GUID, which does not seem to correspond to the objectID in Azure AD, nor any of the other GUIDs we can expose. It does differ from user to user, so it’s perhaps some “internal” SharePoint GUID? Anyway, the last part of the address, just after the @ sign is the tenant GUID, again prefixed with SPO and underscore. The address can be edited, removed or added just like a regular SMTP address, however for objects synced from the on-prem AD this will not be possible (although they do get the address as well!). Another interesting fact is that the address is not visible in Azure AD (via the MSOL cmdlets or the Graph API), which in turn makes it hard to confirm its existence for any non-mailbox users. This entry was posted in Exchange Online, Office 365, SharePoint Online. Bookmark the permalink. 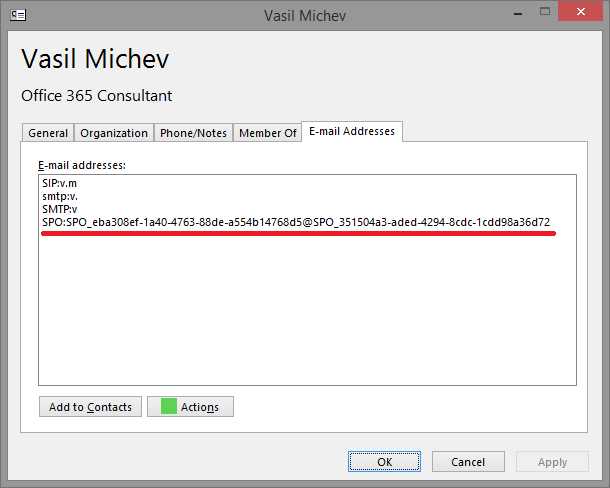 The SPO type email address indicates that it is related to SharePoint Online features. The fact is that it only appears on objects with a SharePoint Online license confirms this. Currently, there is no official documentation shows that describes the function of this new type email addresses.